** ADOPTED!! **Chubby is new to our rescue and currently being evaluated in foster care. His previous care takers said he is good with other dogs and even cats! This sweet boy is around 2-3 years old. 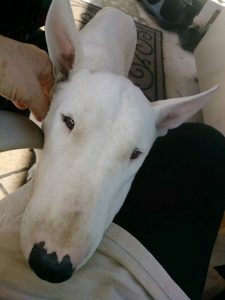 Visit our website – www.texasbullterrier.org – and click on the Rescue tab to complete an online adoption application for Chubby! We are interested! Please could you send me more information on chubby! How is he around children? Thank you for your recent inquiry regarding our rescued bull terriers. * Available dogs are listed on our weekly Rescue Report – http://www.texasbullterrier.org – click on the “Rescue” tab on the left. If you are a renter, you MUST have your landlord’s permission in advance and confirmation that the bull terrier breed is permitted by your landlord and insurers. Because many bull terriers can be clumsy and rambunctious in play, we seldom place dogs in homes where there are children under the age of about 5 or 6 years, as they can easily be knocked down by accident. The majority of bull terriers have a high prey drive. Occasionally we have a dog in rescue that has been raised around cats, but in general we cannot place bullies in homes where there are cats. * Step 1 : Complete and submit the Adoption Application form on our website – http://www.texasbullterrier.org – click on the TGCBT Rescue tab (if you need a Word format of this form emailed to you instead, just let us know). Please dont wait to complete the form, as you may miss out – we often have a very fast turn-around! All our rescued bull terriers are temperament tested, spayed/neutered, brought up to date with shots & wormer, heartworm tested/treated and microchipped. Your new dog will come with a collar and leash and ID tag. Adoption fees typically range around $325, to help cover these veterinary expenses. If at any time in the future, for what ever reason, you cannot keep the rescue dog, he/she must be returned to our rescue program. If you need any further information, please let me know. We look forward to helping you find your new family member!